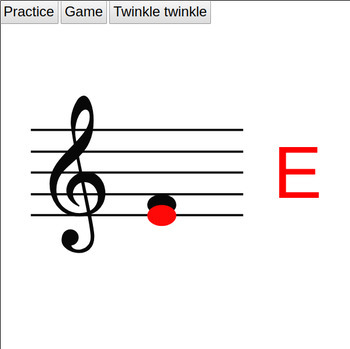 This is a piano practice app that can be run in Chrome or Opera browsers. You need a MIDI-compatible digital piano keyboard, connected to your computer, for using the application. Fortunately most modern electric pianos support MIDI connection. Open index.html to start using the app. When you connect it, as you play white keys between Middle C (c', c1) and Treble C (c'', c2), their note appear on the screen. At the start of the program, you are in Practice mode. You can start Game mode by clicking on the button in the top left corner. In Game mode, the computer gives you notes that you have to play back. There is a third mode, where you have to play a simple song.